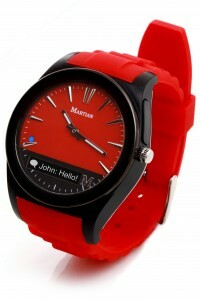 Martian Watches™ is a California-based company known for manufacturing the first intelligent watch with voice commands using Bluetooth technology. It has specialized in developing wireless devices with a good design and among its product line, we can find the Martian Notifier, a smart watch focused on providing notifications. The watch is designed in a classic round style and the bottom part of the display has a small OLED screen where we can see the notifications of the smartphone. It is designed as a complement to the phone, an aid in receiving and organizing all kinds of notifications. We just need to configure from the smartphone which notifications we want to receive, choosing between all the apps we have installed that provides any kind of notification. Of all the apps likely to send messages, we can configure each one independently, selecting only receive notifications from the apps that we are more interested on. Moreover, it lets us to set the type of vibration that we want to associate with each notification, so we can know without even looking at the watch if we have received an email, a whatsapp message, or if we are late for the next meeting. It also includes a physical button that activates the microphone of the Martian Notifier, activating a voice command mode for our smartphone. Through these commands we can answer and make calls, emails and text messages, control music, search directions, browse the web, etc. The Martian Notifier is compatible with iOS and Android devices and will be released during the second quarter of this year. The official price is $ 129, a very reasonable price considering the quality of the watch itself.